Specifications: 1) Custom sizes, shapes, edges and sink cut-outs available by special order. 2) Random sizes and edge profiles as customer required. 3) Color: Black, Grey, Pink, White, Red, Yellow, Green etc. 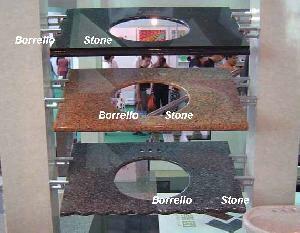 4) Material: granite, marble. 5) Price Terms: FOB Qingdao, CIF.